I wanted to share this guys blog. Obviously I don’t agree with everything he says but he gives a good rundown of these two gates that intersect on the Galactic Meridian and Ecliptic Meridian. I’m also going to share the Stellarium videos I did of each of these gates for the next 7 years. See if you catch anything. I will post pictures on the next post of what may be significant with these Gates in the near future. The constellation Ophiuchus the “Serpent holder” [thus S-Ophi-Isis. 7M] sits 180 degrees across Orion (Ausar). Face one you face the galactic center, face the other you have your back to the galactic center. Ophiuchus sits in the direction towards the center of our galaxy. The ancients called it the ‘Gate of the Gods’. Orion (Ausar) sits in the opposite of this direction, which would be considered the ‘anti-galactic center’ and the ancients called this direction, the ‘Gate of man’. In the Greek tale, Ophiuchus tramples on Scorpio and having received the elixir of life from the serpent, restores Orion (Ausar) to life. At the time, Orion (Ausar) set at sunrise on the winter solstice, thereby symbolically entering the Underworld, to be reborn as he rises heliacally on the summer solstice. As Orion/Ausar “dies” (sets at sunrise) on the winter solstice, Scorpio does rise — but with Ophiuchus on its back, rising heliacally (rising with the sun). And as Scorpio “dies” — when Orion rises heliacally (rising with the sun) in the summer — Ophiuchus also is setting, driving the Scorpion down into the Underworld beneath her. Ophiuchus and Orion represent part of our ‘cycle of life’ that we all incarnate into as going from “earthly beings” through the ‘gate of man’ – “eternal beings” through the ‘gate of Gods’. Ophiuchus is the ‘crossing over’ constellation, as you move your sight through the sky, observing the signs on the outside of Ophiuchus, starting with Scorpio and move your eyes over to Sagittarius… you ‘cross over’ the direction towards the galactic center. The sign opposite in the sky from Ophiuchus is Orion. Now imagine the Earth tilting to one side, allowing the elliptic path of the Sun to ‘cross’ up into Ophiuchus – or Ophiuchus to seem to ‘dip down’ into the elliptic path. Now move your wobble and tilt to about 13,000 years later. Earth is tilting to the other side of the sky. Orion, is on the side that our Earth is tilting towards. The constellation itself depicts Christ wrestling and getting control of the serpent. Ophiuchus has his foot on Scorpio, this represents Christ walking on water (Scorpio being a water sign). Scorpio being the sign of death and rebirth and is the only sign with three symbols. 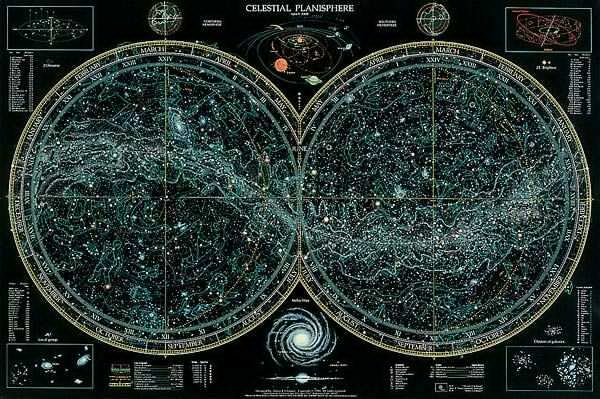 We are almost ready for our earth and solar system to move through the galactic plane, the axis shifts and the stars Draco (the Dragon) and Ophiuchus the Serpent bearer will be seen in the skies rather than Orion (Osiris). The new light codes are here to assist us in the next step of the great shift. The old initiation being through Orion (Osiris) and the 11:11 doorway of oneness. As the initiation of the great pyramid took us through the doorway of Orion (Ausar), the one, the union of opposites occurred. As the earth and solar system move through the galactic plane, the axis shifts, the cosmic egg/serpent (kundalini) vibrating fully with life force, creation energy, begin to move to the crossover point and into our higher light octaves just like the Maya and KMTitans did in their time. At the opposite sides of the heavens to Orion (Osiris) is Ophiuchus the 13th sign. On the other side of the Golden Gate/Gate of God, lies the Silver Gate (the Gate of man). 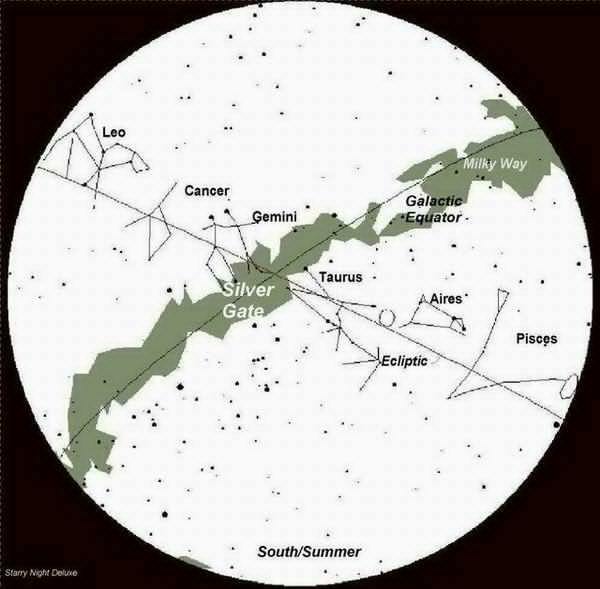 The silver Gate (the Gate of man) is between Taurus/Het Heru (Pleaides) and Gemini. The seven stars are the Pleiades (the leg of the Cow or Bull/Taurus). Orion (as christ in Revelations) points the way to the Pleiades. Orion in ancient Egypt/Kemet is depicted holding Aldebaran (the brightest star in the Taurus constellation) in his hand. Aldebaran in Hebrew means “the follower” as this star follows the Pleaides’ 7 stars. On May 20, 2012 there will be a solar eclipse conjunctive the stars of the Pleiades. A unique alignment of the sun and the moon between the Earth and the stars of Pleiades. “Thirty-three cosmic ruler,fix thy house, crescent horn moon, follow seven lamps, seven stars, Pleiades stars. Hear O King, Light 7 lamps in a row, thou wilt firmly fix thy house. 7 demons” are the 7 stars of the Pleiades.The “Demons” were code words for “stars”. On the other side of this gate lies the Golden Gate (the gate of God) which is located between Scorpio and Sagittarius (were Ophiuchus is located). When the Sun aligns with the galactic center were Ophiuchus is located, this will complete the union between “Mother” and “Father”. To enter the gate of man, means death to your self. The doorway through Orion is closing as we unify ourselves, merging light and dark within as we then move through the next doorway which is Ophiuchus the Serpent Bearer which is exactly 180 degrees opposite Orion, and as we unify the Serpent Kundalini rises in us and we become resurrected. Just like Obeah is secret, hidden, and unknown, the “thirteenth constellation” Ophiuchus the Serpent Bearer is secret, hidden, and unknown. According to Greek legends Ophiuchus as Asclepius (the Egyptian Imhotep) was murdered by Zeus because he was on his way to bring healing herbs to humanity which would have given them immortality and the ability to raise people from the Dead. Asclepius provides the answer to why a zodiac sign seems hidden. The earth has a heart beat, physicist call it the shuman resonance field. We are now over 12 beats per cycle. When we reach 13 beats (Heart chakra love consciousness) the magnetic field will drop. The local universe will become electric conducting heat to the planet. The Coptic key of the Messiah is 4555 which speaks of ‘azozeo’ the cosmic light located in the constellation which is mother and child. Some claim that this is the sign of Ophiuchus between Scorpio and Sagittarius. In other words do you understand that electro-magnetic energy from the stars has an effect on the kingdom of the ruling operation of the earth? The electromagnetic energy from the bodies of the constellations, act upon the cells of the brain able to understand these light codes with information, as this energy opens the gates of your city (the cranial nerves). Ophiuchus is a higher octave of Scorpio. “Scorpio, Spiritual death, Change ” is a transition from one state to another. It is this earth, which is the death of the divine soul. The Gods (us) came to die so that we mortals might live. When humans have the right understanding, they can birth the God and thus uplift earthly existence. As long as people are ignorant of their divine purpose, the Gods are dead, and this earth has become hell or the underworld to the gods. The worst “punishments” we face are in this life. If we do not nurture the divine soul here and now, we punish ourselves by not achieving our true potential. The divine soul “falls” to earth and incarnates in human beings. This is Lucifer, the light bringer, coming to earth. 18 yrs of Christs life is missing in the bible. From the age of 12 to the age of 30 is missing. The Sun actually “leaves the zodiac” for 18 days while it is transiting (crossing) the astrological sign of Scorpio (the third water sign). During this 18 day period the Sun is outside of the boundaries of the traditional zodiac and enters the constellation of Ophiuchus (The Serpent Bearer). […] The ancient Greeks, who received much of their knowledge from Egypt, believed that souls reside in the Milky Way between incarnations, and that there are 2 “gates” on the Milky Way. These are the Silver Gate of Gemini, through which souls descend to earth, and the Golden Gate of Sagittarius, through which souls ascend. Other versions say the souls of men can ascend by either gate, but that the Silver Gate leads to reincarnation and the ancestors, and the Golden Gate leads beyond reincarnation. The Golden Gate is also that through which the Gods descend. The Silver Gate is just above the “hand” of Orion, who the Egyptians associated with Osiris, and they depicted him holding a star in his hand. The arrow of Sagittarius and the sting of Scorpio define the position of Galactic centre, with accompanying mythology. The foot of Ophiuchus, the Serpent Handler is also right over Galactic Centre, as Raymond Mardyks points out. This happens to be at the Golden Gate which Gilbert brings attention to, while at the Silver Gate, lies the Galactic anticentre – the direction in which the Galactic Superwave departed, which is defined by Orion’s club & the horns of Taurus, or the ankh in the hand of Osiris. The nearby Pleiades constellation is associated with catastrophe, not just in Mexico, but also ancient Persia and many other cultures, LaViolette tells us. The Mayan’s say “When the Serpent Feeds the Eagle, then Quatzlcoatl-The Many plumed One-returns. In the many eyes on the wings, perspective is consumed into oneness (implosion), called “E Pluribus Unum” (out of many One) on our dollar bill. The serpent/kundalini feeds the Eagle (pineal),when the serpent spine “Juice” kundalini fire crosses the spark gap of the hypothalamus and meets the “winged bird” i.e pineal gland,one is reborn,which Ophiuchus represents (rebirth). Just like Ophiuchus is located at the galactic center/milky way (the hypothalamus gland is the egg/”philosopher’s stone” at the mouth of the serpent) at point “0”. You could say ophiuchus relates to the hypothalamus gland that sits in your galactic center (at the center of your brain between your left and right brain), this is the true “3rd eye” and is connected to your reptilian/serpent brain (limbic system), where the pineal gland (solar/masculine) and pituitary (lunar/feminine) meet at point “0”(hypothalamus gland), the alpha and the omega. Is there more to the story about Osiris/Asar being cut into 14 pieces and 1 piece not being found. Only 13 pieces of him are put back together. Even though the Sun, over a great years time will move through 14 signs (the normal 12 plus Ophiuchus and Orion) it wont ever be in 14 signs during the same year. As the tilt of the Earth allows Ophiuchus to enter the Suns path for part of the great year, the other part of the great year allows Orion to enter (always being in 13 though). We just entered the Summer solstice. On the Summer solstice, the Sun sits at the gate of man (between Taurus and Gemini). Between Taurus and Gemini sits the top cusp of Orion where the Sun actually rides this cusp for 3 days every year. Some of you were born during this time ,and so your zodiac (or Ascendent) sign would be in “Orion'(osiris/Asar) But we are unaware of this aren’t we? We are not in tune to know such things due to many modern day ‘practices’ and watered down astrology toy programs of today. Watered down toy programs will never show Ophiuchus, or Orion rising. Being made for entertainment (or scam) purposes, they only mimic the sky that never was. Saturn/capricorn ties into the golden gate of God and man. So Saturn would be again the father of a Golden Age and a golden mountain that the cap of the goat would have originally also represented the Yang mountain of fire energy rising. Capricorn the goat is the first rising sign after the winter solstice (Gate of God), he is a mountain goat, a climber and he leads up to Gemini which is his crowning glory of the Yang energy. After June and Gemini Yang power begins to decline again.